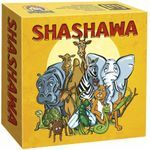 Shashawa plays the same as Spoons, with a set of four animal cards being added to the deck for each player in the game. When a player collects four animals of the same type, the player shouts "Water! ", then everyone grabs for the water tokens in the center of the table. The player who comes up dry collects a drought token, and anyone who collects three drought tokens is out of the game. After removing a water token and a set of animals from the deck, play continues. Once only two players remain, the player with the fewest drought tokens wins. Ties are possible.